Step By Step offers full day care for elementary school age children during the summer. 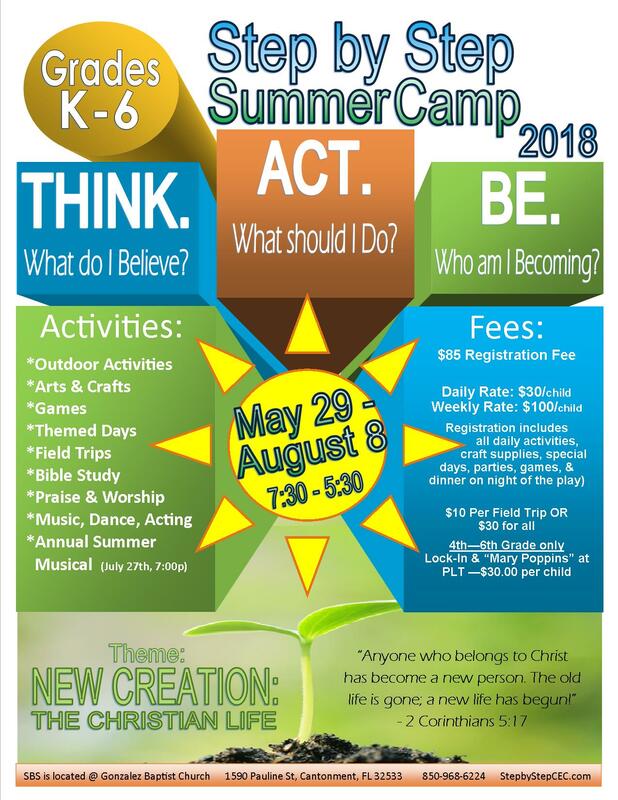 Our Step By Step Summer Camp Staff has experience in working with Elementary age students and seeks to promote a summer of fun balanced with teaching character skills, Biblical teaching, creative arts, physical activities, team activities, music, and field trips. 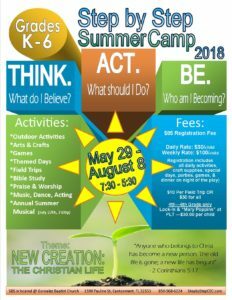 Our Summer Camp culminates with a full creative arts program involving music, dance, and character roles that will express to the audience many lessons learned over the summer. We offer daily care or weekly care. If your child will not be attending on a regular weekly basis, and you will only need specific days, please let us know the days your child will be attending one week in advance. Please keep up with your Summer Camp Schedule included in your Summer Camp parent letter and check your Step By Step schedule for days we will be closed. As a class, we often talk about sin and salvation and becoming a follower of Christ. Why do we need a relationship with God? HOW do we have a relationship with God? Sometimes, we have kids come to the saving knowledge of Jesus Christ! Now what? What does it really mean to be a Christian? When we accept Christ, there’s a life change that happens! We are a new creation! The Bible tells us in 2 Corinthians 5:17 “Anyone who belongs to Christ has become a new person. The old life is gone; a new life has begun!” For 11 weeks, we will explore what it is to become a Christian: What do I Believe? – There is a God. He’s a personal God. We can have a relationship with Him!…What should we Do? – Total surrender. Worship. Growth. Sharing my Faith…Who am I Becoming? – Love. Joy. Peace. Patience. Kindness. Goodness. Faithfulness. Self-Control. Humility. Hope! We are hoping to help equip our children with the tools they need to come to a relationship with Christ and even move forward with that relationship! Our annual summer musical will be focusing on this theme as well. We hope you will join us as we go on this fun journey this summer!